Imagine Ellen's surprise when Princess Mirror-Belle climbs out of the bathroom mirror! She comes from a world where bubble fish swim in the bath, elves sleep in slippers, and brave knights fight fire-breathing dragons. And while Ellen has chicken pox, Mirror-Belle has dragon pox - but she knows just the cure. 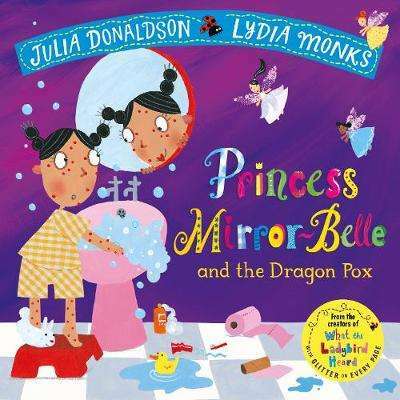 Princess Mirror-Belle and the Dragon Pox is a magical story from the stellar picture book partnership of Julia Donaldson and Lydia Monks, creators of What the Ladybird Heard. A fun story about an unexpected friendship, paired with bright and distinctive illustrations and glitter on every page, this story is perfect for reading together.Enjoy all the stories from Julia Donaldson and Lydia Monks: Sharing a Shell, The Princess and the Wizard, The Rhyming Rabbit, The Singing Mermaid, Sugarlump and the Unicorn, Princess Mirror-Belle and the Dragon Pox, What the Ladybird Heard, What the Ladybird Heard Next and What the Ladybird Heard on Holiday.